Feature Image: Professor of Innovation at UT Austin Bob Metcalfe with Francisco Gomes, associate dean for graduate programs in UT’s school of architecture at the stART Studio. Nurturing professor led startups to help them take their inventions out of the laboratory and into the marketplace is the focus of the Innovation Center at the University of Texas at Austin. The center, which is part of the Cockrell School of Engineering runs The StARTup Studio, which is held monthly during the Fall and Spring semesters to bring together professors, investors, engineers and other invited guests to hear 15-minute-long presentations from startups followed by a question and answer session. 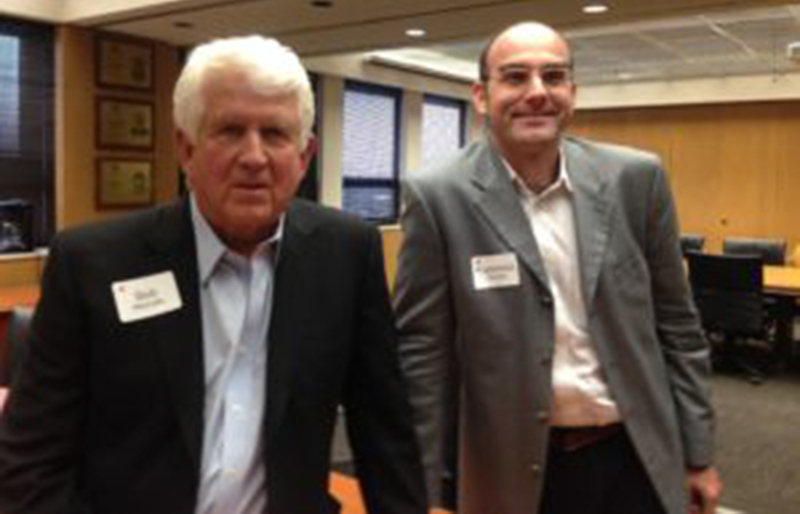 UT Professor of Innovation Bob Metcalfe, Ph.D., leads the center. Louise Epstein is its managing director and Ben Dyer serves as entrepreneur in residence. On Thursday, three professors took to the podium in a conference room on the 10th floor of Ernest Cockrell Jr. Hall to present a diverse mix of ideas including a new type of cement block, a fiber optic catheter to deliver drugs to treat glioblastomas or brain tumors more effectively and a random number generator to ensure encryption of data. The audience included several UT faculty members including Professor Metcalfe, inventor of Ethernet and Professor John Goodenough, the inventor of the rechargeable lithium-ion battery. First up, Professor Francisco Gomes, associate dean for graduate programs in the school of architecture, presented MineralBuilt, which is creating better, cheaper and more energy efficient cement building blocks. Gomes, who also founded Gomes+Staub Architects in 1999, began working on the idea a few years ago and formed his company in the last year to take its invention to market. “It’s lighter and uses less material than a normal concrete block wall,” Gomes said. A builder can get 50 percent more efficiency per wall using the MineralBuilt blocks, he said. The blocks use a new mold that is configured in a way that uses less materials and still provides for structural integrity. Gomes has gone through the iCorp Program, based at UT’s IC2 Institute, which helps researchers commercialize technology. The initial customer for the MineralBuilt blocks are owners and developers of low-rise buildings like retail stores, schools and warehouses. The company’s business model is to charge the manufacturers of cement blocks a licensing fee to use its mold. The company has two utility patents on its product and one patent application pending. It is also working with the University of Texas’ Office of Technology Commercialization to license the technology. MineralBuilt is raising $100,000 to complete its structural testing. It is also building a house to showcase the blocks to potential customers and it’s working with a company based in Round Rock to produce its production molds. Chris Rylander, Ph.D., assistant professor in the department of mechanical engineering, presented the Arborizer at the stART Studio. Next up, Chris Rylander, Ph.D., assistant professor in the department of mechanical engineering, presented the Arborizer, a new kind of catheter to deliver drugs more effectively to eliminate brain tumors at the root. He hasn’t yet created a startup company.Rylander has been working on the Arborizer project for several years. The intellectual property behind the technology is owned by Virginia Tech. Rylander moved to UT two years and has been working with the Austin Technology Incubator and IC2 Institute since then. He also went through the I-Corp program. The Arborizer focuses on treating glioblastomas, which is a deadly brain form of brain cancer that afflicts 12,120 people every year in the U.S. And 95 percent of those people die within five years of diagnosis, Rylander said. The treatment is surgery, radiation and systemic chemotherapy. The challenge to treatment is the brain blood barrier that makes accessing the entire tumor difficult. With the Arborizer, the treatment involves inserting a catheter in the brain and pushing drugs directly into the brain to kill the tumor cells. With the Arborizer, drug companies can push large molecules into the brain in a much more targeted way. The Arborizer has received one patent and a second patent application is pending review. Rylander has raised $1.2 million in funding so far. The next step is to apply for additional grants and funding and to begin pre-clinical trials in animals, he said. The market for the Arborizer has potential beyond treatment of brain tumors, Rylander said. It can also be used as a platform technology to treat soft tissue tumors such as colon, pancreas, prostate and others, he said. And it also could have applications in the cosmetic surgery industry, he said. (Second from the left) Benito Fernandez, associate professor in the department of mechanical engineering, presented “CHECK,” a chaotic hybrid encryption communications kit. Pictured with his students. Lastly, Benito Fernandez, associate professor in the department of mechanical engineering, presented “CHECK,” a chaotic hybrid encryption communications kit. The hardware solution combines analog and digital signals to create encryption technology for a random number generator device used to secure data. The project has received National Science Foundation funding and the team has gone through the I-Corp program at UT. The startup is in the process of building a prototype and then selling it, Fernandez said. The technology can be used to secure power plants, data centers and other facilities, Fernandez said. Get Out of the Lab!